Catering to the way students communicate, more and more university libraries are providing instant live chat services to users who need help while accessing the library over the Internet. 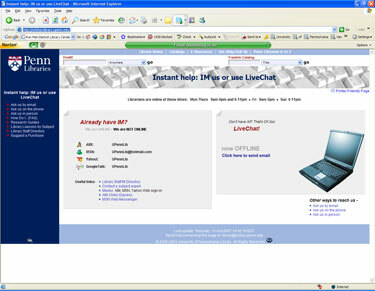 For example, a chat screen may pop up when an online patron clicks on a Help tab from the library's main page. A librarian then corresponds via chat to answer the patron's question. At the University of Pennsylvania, librarians provide help to students through both instant messaging and an outside live help service facilitated by Velaro, a long-time provider of live help software that recently launched an academic-focused Live Help initiative. Velaro currently provides live help and Web-based chat support for universities including the University of North Carolina at Chapel Hill, Indiana University, Duke University, and the University of Wisconsin. To UPenn library users, the difference between the two services is somewhat transparent. Users just know that clicking on the library's help tab offers two options: They can chat with a librarian through their personal instant messaging account (AIM, MSN, Google, or Yahoo! ), or they can opt to use Velaro Live Help. But for the library, the distinction is key, according to Charles Cobine, research and instructional services librarian and coordinator of digital outreach services at UPenn's Van Pelt-Dietrich Library Center. Using Velaro's live help system gives the library valuable back-end reports after the fact that allow them to analyze how and when students are using their services. Velaro reports can tell Cobine, for example, what kinds of questions are being asked most frequently, along with the IP address a question has come from, allowing him to pinpoint location on or off campus. He can also tell the time a question was asked, so that librarian help services can be allocated to peak usage times. The library subscribes to Velaro Live Help on a quarterly basis; a piece of client software must be downloaded to any computer where a librarian or volunteer may work answering chat questions. Otherwise, the system is completely Web-based; users don't need to run any special software on their computers to use the system. The chat infrastructure comes from Velaro, but actual assistance is provided by UPenn librarians, who are professionals with extensive experience in given subject areas. The university currently provides the live help service from 9 a.m. to 6 p.m. during the fall and spring semesters, along with evening hours from 9 p.m. to 11 p.m.--a shift Cobine admitted that it's sometimes hard to find staff to fill. Although a free chat service called Meebo is often used by university libraries, Cobine said he considered and dismissed Meebo, at least for now. The primary reason: He relies on the reports Velaro furnishes and appreciates the ability Velaro offers to brand the chat help screens with the university logo. "Meebo doesn't really work with our needs ... because we make a lot of decisions based on data we can collect and analyze to assess patrons' needs." Cobine also looked briefly at products specifically geared to library support, but he found them inaffordable. There are additional advantages to paying for the Velaro help system to augment standard free chat services, according to Cobine, who had previous experience with Velaro at the University of North Carolina. Two distinct populations of users take advantage of the two help systems, Cobine said. Some students may prefer not to use their personal instant messaging ID with the library system, opting instead for the relative anonymity that the Velaro system provides. And some library users, of course, may not have a personal instant messaging account. Foreign exchange students in particular, Cobine said, are likely to opt for Velaro when they ask for help via a chat screen. "The live chat system is probably more popular than the instant messaging service," Cobine estimated, "but they compliment each other. They don't interfere. It's two different service populations."